AmazonFACE is a free-air CO2 enrichment (FACE) experiment assessing the effects of increased atmospheric CO2 on the ecology and resilience of the Amazon forest. The experiment will simulate the atmospheric CO2 composition of the future in order to help answer the question: How will rising atmospheric CO2 affect the resilience of the Amazon forest, the biodiversity it harbors, and the ecosystem services it provides. Carbon Dioxide was discovered by the flemish chemist Jan Baptist van Helmont in the 17th century. He called the gas that evaporated from burning wood „Spiritus sylvestre“, „forest spirit.“ In the installation “Espirito da floresta/Forest spirit”, a local ecosystem in the Amazon rainforest is represented acoustically. The acoustic emissions of a tree (Ocotea Sp.) and the environmental sounds in the field station of the AmazonFACE research project were recorded in 10-minute intervals over three days. The sounds of the tree and its inhabitants were recorded using specially developed contact microphones at three positions – in the crown, on the trunk, and at the roots. These sounds can be heard through the sound panels of the installation (in the module to the right of the projection surface), together with the environmental noises (through the video projection surface itself) and the sonification of the CO2 concentration at three heights in the forest (through the module behind the projection surface). 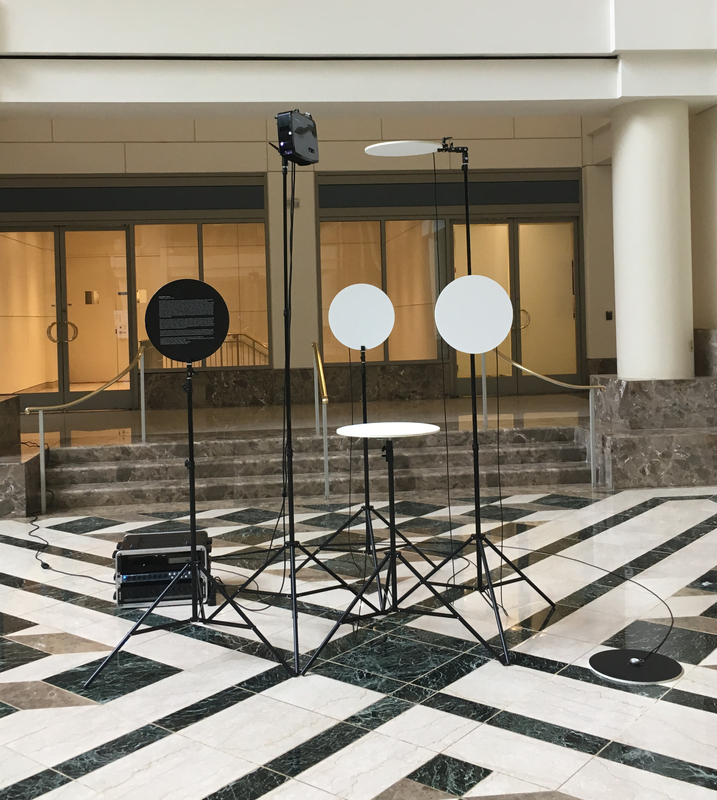 In the sonification, the CO2 data flow is used to control the generation of sound in the installation’s computer. A flute-like synthetic sound is used in for data sonification: this is reproduced for each of the three measurement heights, and the current measured values control the pitch of the three flute-like sounds. By these means the dynamics of the CO2 concentration at three different “storeys” in the rainforest are rendered audible. 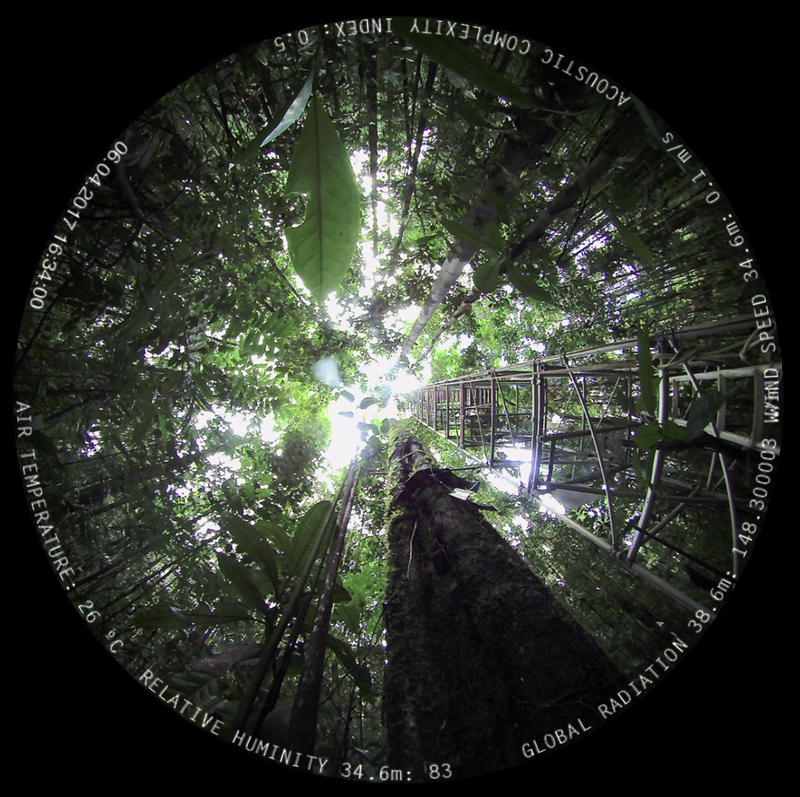 In the installation changes to the soundscape of the rainforest at an increased atmospheric CO2 concentration in the atmosphere are rendered observable. Beyond that, new acoustic research methods of biodiversity will be tested. The so-called Acoustic Complexity Index ACI is displayed in the video projection. In this acoustic estimate of biodiversity, the amplitude envelope is being analysed in a number of frequency bands: the greater the number of different volumes measured over a certain amount of time in specified frequency bands of the audio recordings, the higher the acoustically quantifiable biodiversity – what interests us here is the dynamic of this value over short and long time periods. Will biodevirsity decrease under an elevated CO2 concentration? This pre-study is financed by the ZHdK foundation and AmazonFACE. Screenshot of the video projection.